The staple of any energy drink, bar, or gel is carbohydrate, and Hammer Gel stands alone in today's glutted market of energy products. A look at the ingredient list on the label will tell you why: we use long-chain complex carbohydrates for smooth, consistent energy release. There's only a trace of sugar, so Hammer Gel doesn't set off wild insulin spikes causing "sugar high" and "sugar crash." You won't find our products saturated with cheap, ineffective, commercial-grade sugars, which can ruin health and performance. Hammer Gel is an easily digested, concentrated source of complex carbohydrates with four amino acids added to enhance performance and prolong energy levels during intense training and competition. 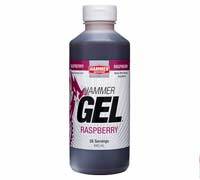 Hammer Gel has a syrup-like consistency that mixes easily with water if so desired. You can drink it straight, dilute it, or use it to flavor other components. Use it before, during, and after exercise. For over a decade, Hammer Gel has been the benchmark of concentrated carbohydrate energy, primarily because of what it doesn’t contain—Hammer Gel has no added refined, simple sugars and artificial colors or sweeteners. Choose either single-serving pouches or the cost-effective jugs for even, reliable energy, not the “flash and crash” of sugar-loaded products. You get only what’s good for you: complex carbohydrates, natural ingredients, and real fruit. The result is a great tasting concentrated fuel source that goes down and digests easier than any other energy gel. Hammer Gel is versatile as well – you can drink it straight, add it to your water bottle, or combine it with Sustained Energy, HEED, and Perpeteum to create a variety of tasty energy combinations for any length activity, anywhere, anytime. Hammer Gel is perfectly compatible with all other Hammer Nutrition fuels. During ultra distance events, while Hammer Gel cannot be your sole source of calories every single hour, it may be used occasionally to give you a little variety in what you’re consuming. Warnings: Refrigerate opened bottles for storage longer than two months.